Though Guntur Talkies was a money spinner, it was perceived as a sleazy film by general crowd? Ladies Tailor which was released in 1986 went on to become a big hit and a classic. If that film were to release now, it would surely be termed as ‘boothu cinema’. Our audiences and censor board used to be progressive in those days. Prathighatana wouldn’t have seen the day of light if it were to release now. April 1 Vidudala and Aa Okkati Adakku were huge entertainers and were big commercial hits. Guntur Talkies is a much sophisticated film compared to Aa Okkati Adakku. As a society we are going backwards. 70’s and 80’s were the most liberated time period, I think. With the advent of internet, people are bombarded with information. They are confused and don’t know which is true and which is false. As a society, we lost track of who we are and where we are heading. I am not surprised when viewers of Guntur Talkies were divided into two groups: One group calling the film sleazy and the other film praising it for its aesthetics. We consciously promoted Guntur Talkies as adult film and we asked everybody not to take kids along with them. When the unit visited Sashikala theater for the evening show, I noticed a women waiting along with kids. I told manager to return her money and send her back as Guntur Talkies is not meant for kids. Gutur Talkies was made in a budget of Rs. 1.5 cr and we spent around Rs. 80 lakhs on publicity. Recently Nitin (as his father Sudhakar Reddy is a distributor) told me that Guntur Talkies has collected over 21 crores, which is equal to Nithin’s Gunde Jaari Gallanthayyinde. I had fun making that film and am happy with the result. Naresh’s bathroom scene is the most talked about in the film? India is an overcrowded and populated country. The only privacy most of the people get is in bathroom. I think every single person in India go through that situation at least once in their lives. That’s why everybody has got connected with that scene. Jeevitha called me in November 2015. They want to gaze me basically. I met them again in March 2016. They said that they wanted to make a film and considering me as a director. They were considering a few remakes. I said no to remakes and suggested that I have a story that suits Rajasekhar. I narrated the story of Garudavega to them. When I wrote that story in 2006, it was meant to be made any young hero. Hence I had to customize it Rajasekhar. They said they liked the story and premise. I asked them for some time. What are the changes you made to the original script? I brought NIA (National Investigation Agency) backdrop to it. Then, I split heroine character into two (brought in Pooja Kumar as wife and Shraddha Das as a dynamic TV journalist). I have also incorporated a conflict of personal life vs professional life. A nagging wife is something that everybody connects to. We (me and Niranjan) decided to blow it up while writing. We forgot that it’s Rajasekhar’s film and decided to write a larger than life action film. 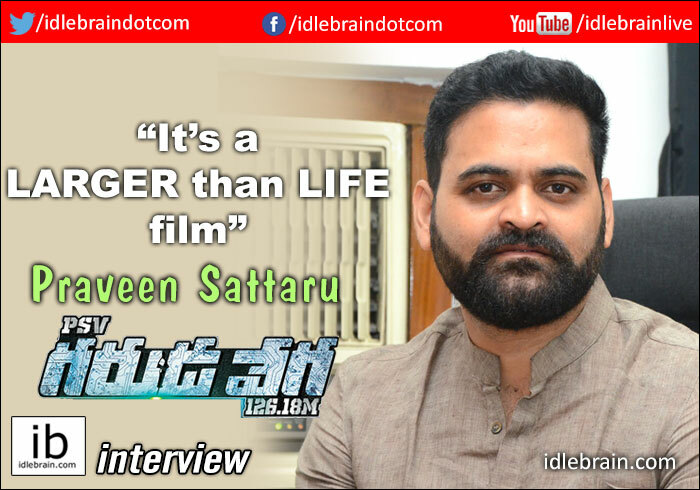 Garudavega is a larger than life in terms of action sequences, climax and conspiracies. We had larger than life climaxes for films that were made before 90’s like Jagadeka Veerudu Athiloka Sundari and Aditya 369. Those were the climaxes which suit 70mm screens. What happened to those climaxes? I wanted to bring such climaxes back with GarudaVega. If Rajasekhar has to comeback, this should be the film. People should stop and notice it and then say ‘what the f**k did he do?’. It cannot be a mediocre film. We blew it out of proportion. Jeevitha and Rajasekhar were blank after listening to the script. They were in shock. Rajasekhar’s daughters felt that it's too intelligent. I told them that audiences are too intelligent and they will understand and appreciate. Jeevitha is hellbent on making this film. She has put in her heart and soul into Garudavega. It’s been quite a journey and I have never seen a woman like that. She handles multiple things at the same time and she is a fighter. I can undoubtedly say that she is an iron lady. I wrote/designed the action sequences. We hired a Bangkok action coordinator Seelum Pradit (Nung of The 1’s Action Team). We bought miniature size toys and explained how I wanted action sequences. He took a video of it and executed them. There are seven action sequences in the film. All are larger than life action sequences. I found a group of studios in Georgia. The Government of Georgia also gives 30% discount for promoting their country. We wanted to shoot 5 action sequences in Georgia. These action sequences are supposed to happen in Darjeeling, but shooting abroad is convenient. We could have shot 5 action sequences in 1.4 cr if we go through those studios. And I thought I could finish the film in a budget of 6 crores. But the producers wanted to do it on their own in Georgia. I told them that I would only involve myself in getting the right output, not into production. We could shot only 3 action sequences in Georgia. We shot for 12 days, but stayed there for 33 days. After working for a couple of days, we had to stop shoot and look for funds to come in. Then we shot a sequence in the border of Thailand and Cambodia. We shot another action sequence in oil rigs of Johar Baru (in the border of Singapore - Malaysia). The total number of working days was 90. But there was a lot of gap between schedules as the producer has to pool in money in between. I made him fit into script and made sure that you see a new Rajasekhar in the film. Rajasekhar has the habit of pulling his sleeves up when he wears full-sleeves shirt. I made him wear half sleeve shirts so that there will not be any necessity to pull up his sleeves. He has an infectious big broad smile. There is no scene in this film where he shows his teeth while smiling. I made him underplay everything including anger. Rajasekhar wears gaudy colors. We went with shades of blue and denim in Garudavega. But, Rajasekhar is kind and gracious enough to follow the suggestions. He came up with a fabulous performance. The tone of the film is also blue, green and gray. Most of the Telugu films have glossy and colorful look. But for Garudavega, we deliberately went with this color tone. We spent 800 hours for digital intermediate (color correction). What does PSV Garuda Vega 126.18M title signify? I cannot reveal what title exactly denotes. PSV means Platform Supply Vessel. 126.18M is dimension of the vessel. GarudaVega signifies the speed of hawk. There are two songs. Premale is a soothing and beautiful melody. Deo Deo song is already a chartbuster. Vishnu Deva choreographed it on Sunny Leone. Reason for casting Pooja Kumar and Shraddha Das? For Rajasekhar, we have to go with popular heroines of yesteryears like Shriya. We tried for heroines who were very popular in early 2000’s. But, none of them were willing to work for this film. We couldn’t go with new heroine as it doesn’t look good. I was looking for a heroine who hasn’t screwed up her career yet, but still looks fresh. Then we decided to cast Pooja Kumar who did just two quality films with Kamal Haasan. I worked with Shraddha Das in Guntur Talkies. As I said earlier, I had split original heroine character into two characters (wife and journalist). I still had affinity towards female journalist character. We need prominent actress to carry that character. Since it’s a journalist character and needs to talk a lot in Telugu, I asked Shradda Das for an audition. She learnt lengthy Telugu dialogues and sent audition videos. I was impressed with her efforts and took her in. She still remembers those dialogues. There are so many delays while shooting the film. Was it frustrating? It was frustrating. I am kind of guy who would have proper pre-production, then go and shoot in one go and then do proper post-production. I hate delays. I have control on all my home productions and we finished all those films on time. For my first and third film I had issues because of distribution. Whenever Rajasekhar comes to sets, he would ask me about scene just like a first time actor. He submitted himself to the film. The producers are so positive and forthcoming. The producers and Rajasekhar made us forget delays and concentrate on shoot. Producers delivered whatever we asked for. I wanted a bridge in Bangkok to be blocked for 2 days. They did it. I wanted to shoot for 10 days in Charminar with 500 junior artists. They made it happen. We all kept faith in Jeevitha and she made the film happen. You have been shifting genres and delivering films with good craftsmanship. Where did you learn? I neither attended film school nor assisted any director. Maybe, it’s because I have a vivid imagination. I conceive scenes, I write and I direct. Garudavega is a racy edge-of-the-seat film with family issues generating humor. Audiences will enjoy action sequences as there is tension running in them. Are you not scared that budget went high? No. I am not scared. What was the budget of Arjun Reddy and how much did it collect? What was the budget of Guntur talkies and how much did it collect? People are appreciating good films. They don’t care who the actor is. Trailer sets the bar. If they like the trailer, they are flooding to theaters. Garudavega is a good film and an entertainer and it will easily make profits. Rajasekhar has dormant fans. He was a superstar once. He is going through a downtime. He just needs a good hit now to bring his glory back! You said you had written the script of Garudavega in 2006. How many scripts you had written before directing your debut film LBW? I wrote 3 scripts. I had Garudavega, LBW and a biopic of Tenkala Satyanarayana, who was an inspiring personality from Vijaya Nagaram who was born in 1920’s. The biopic of Pullela Gopichand will start in the March of next year. It will be simultaneously produced in Hindi and Telugu. The rights are picked up by Vikram Malhotra (Abundantia Entertainment) who produced films like Baby and Airlift. It’s slated for 2019 release. I might finish another film in between. I have a few scripts and a producer. It could be an emotionally draining love story or a hatke story with three cousins.